We entered Puerto Baquerizo Moreno (Wreck Bay) early in the morning. The first ones to welcome us were several sea lions swimming along us to the anchorage. It was really amazing, the anchorage was quiet at that early hour but crowded with cruisers and local boats. Sea lions were everywhere. Entry was straightforward but it took us a while to find a place where to drop the anchor. Soon after we dropped anchor the authorities came and kept us busy for the whole morning, we were so tired that did all the check in process half asleep. After that we had a good ‘siesta’, then went for pizza and ice cream and then back to sleep. The anchorage has water taxis to take you to land as it is not allowed to use your dinghy, which is a blessing as I can’t imagine how you would recover your dinghy from a sea lion, he will most certainly win the struggle. Amazingly we found somebody to fix our windlass that was dying slowly since anchoring several times in Las Perlas and decided to stop working when we arrived here. Our good friend Jose from Tutatis and Murray helped Oscar to figure out what was wrong and dismantle the whole thing. Our agent pointed us to this guy that fixed the problem. 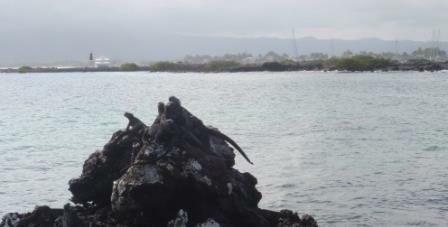 We did an inland tour to the tortoise center to see the Galapagos turtles that give name to the islands. A hiking tour to the top of a hill that has a wonderful view of Isla Lobos, several snorkeling tours, another inland tour to visit a volcano and the highlight of all tours, a day snorkeling trip to Isla Lobos, with lots of marine life where we swam and play with young sea lions. There is a passage among two high rocks where the current carries you while you watch all the fish below, in this passage we snorkeled on top of dozens of tiger rays swimming in formation with the current. 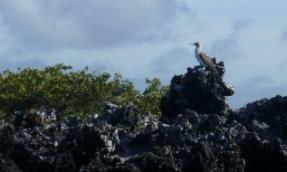 A week was gone and we had to keep going as we decided to visit one more island before leaving Galapagos. We left the anchorage before nightfall for a night sail with 90 miles to go. The anchor was fouled, probably in a rock. We were afraid we were going to break the newly fixed windlass, but going forward we were able to release, relieved that our windlass was working again. There was little wind most of the night, but with a favorable current we sailed at 3.5 kn with no engine and 7kn winds at a good angle of 140, even though we had main sail on first reef, as we usually reef at night. The winds came and disappeared again until they finally died completely in the morning. We were not sure if we would be able to find more fuel in Isabela and didn’t want to start spending our fuel for the big crossing. Arrived at 10:00 AM the next morning and Tutatis was there helping us find a good place to anchor as the anchorage is relatively small and crowded with lots of sailing boats waiting to leave later in the week. As we were approaching the anchorage we could hear chatting in VHF, with several boats getting ready to start the big jump, Galapagos to Marquesas. To our surprise we heard Peter from Joule. We had met Peter and Nanny in St Martin a couple of years before, met them again in Les Saints and now here they were in Isabela! As they were getting ready to depart there was only time to say hello. Peter was organizing SSB radio contact for the big jump among the boats leaving that week. And just like that, the Penguin net was born. Isabela is a laid back island. Wonderful with the penguins swimming between the boats. They are very curious and will come close if you go for a swim. Here we also saw hundreds of iguanas and the famous blue footed boobies. 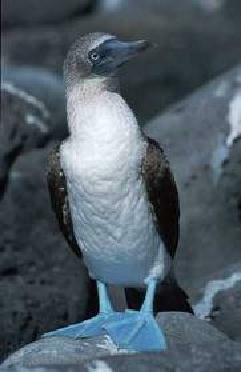 In this island we could use the dinghy and we did several trips to see the boobies, waiting to see their courtship dance, until we finally saw a booby trying to impress his girl, stamping his blue feet on the ground, spreading the wings and doing a circle flight just to come back and do it all over again. She was making him work hard with her indifference. Very cute. The first couple of days were wonderful but as we were starting to get ready to leave for the long trip we found ourselves panicking as Oscar discovered milky transmission oil that can only mean there is sea water coming in and mixing with the oil. The panic really took over when he discovered the problem was present in the 2 engines, which kept me thinking this was not the first time that an engine fails just to have the other one failing soon after. I guess when you know that there is no place you can haul out your boat and fix a problem unless you travel 800 miles against the wind or 3000 + miles with the wind, first thing to do is panic. The second thing is to blame yourself for not finding the problem earlier and the third thing is stop panicking and figure out what to do. Once more our great friend David from Tortuguita came to our rescue with good tips on what to do. As it turned out, as long as the oil was changed regularly and the transmission also used regularly there was not danger to damage the sail drives. So, after getting a good stock of oil we were ready to go. On Saturday we were almost ready to leave, except for a small job at the very top of the mast. Oscar had been waiting for a quiet day with no swell, but it was not coming. For the last 2 days there had been an exodus from the anchorage, we were listening to the newly formed Penguin net every day, about 10 boats in the net, a day or two ahead towards Marquesas. Tutatis, Toroa, Joule among others reporting twice a day on conditions and progress. As many times before, once you are ready go, anxiety kicks in, and we were asking ourselves, are we ever going to be ready? Finally, very early on Sunday morning, thinking this would be the calmest hour of the day, Oscar went up the mast and in a scary balancing mast finished the job. Two hours later, never sure if we were really ready, we lift anchor and off we went. 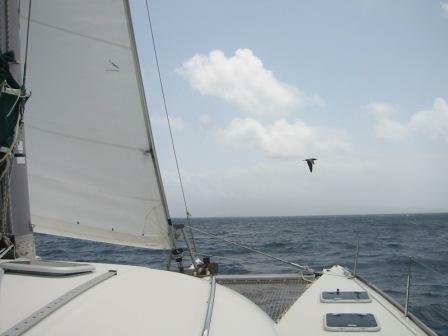 Ahead of us, 3,000 miles to go, something between 20 to 25 days at sea. Clearing procedures are dealt by agents. It is important to choose a good one because you end up in their hands for several of your needs, like fuel and permits to other islands. We were happy with our agent until it was time to buy fuel, but this is a long story for another time. The town is colorful with several restaurants and pubs. Not much in terms of provisioning.